Keep your gloves within easy reach! With the Wall Mount Glove Dispenser, your Nitrile Gloves are always where you left them! 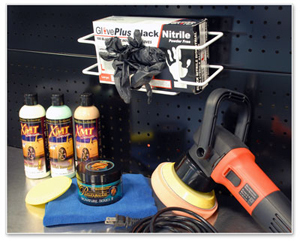 The Wall Mount Glove Dispenser reduces clutter on your workbench by storing your gloves on the wall, out of the way. Turn your garage into a well-organized detail shop. The Wall Mount Glove Dispenser stores your Nitrile gloves on a wall where you can easily locate them. Because your garage can be filled with dust, keeping the gloves on the wall will keep debris out of the box. The Wall Mount Glove Dispenser holds the box of gloves with the opening facing out, so it couldn't be easier to grab a fresh pair of gloves. The Wall Mount Glove Dispenser is made of 18 gauge coated wire for durability. Screw holes in the back allow you to mount the Wall Mount Glove Dispenser almost anywhere. The Wall Mount Glove Dispenser accommodates most boxes of gloves, including our Black Nitrile Gloves. Store your work gloves out of the way but within easy reach in the Wall Mount Glove Dispenser.